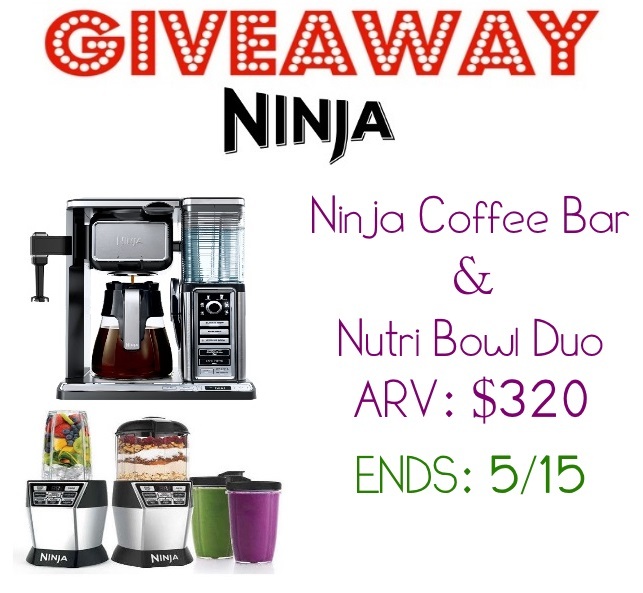 Let's help mom out this Mother's Day with these 2 fantastic items! So my daughter is an interesting kid. For one, she's 7 going on about 25. She is wise beyond her years, and would rather go with Mommy to a rally or protest or rock out to Rage Against the Machine than watch TV or play with her dolls. She is very into science and the environment, and before I went to LA recently, she told me not to eat the seafood because of Fukushima. Not a problem, since I don't eat fish. Anyway.... Like I said, Sophie isn't your typical 7 and a half year old. Even though my kiddo may not fit in with all the other girls her age, she does have one thing in common with them. Common ground, if you will, that she shares with just about every female on the planet: Sophie loves pampering herself, and making herself look and feel beautiful. She loves spa treatments, manis and pedis, and of course, her mineral makeup kit for kids. So when the awesome folks at Zoey Koko contacted me to introduce me to their awesome spa party kits for tweens, I was SO excited. I knew immediately that my Sophie would totally love this idea, and so would her bestie, Lilly! Zoey Koko offers at home spa party boxes for tweens. Every party box comes with individual pouches for each girl that are loaded with all natural skin&nail products, as well a craft. The adventure is guided by a Zoey Koko spa guide. Mother's Day is right around the corner, folks! Have you found the perfect gift for the Moms in your life....Or are you still scrambling to find that special something that expresses your love for her? If the Moms you love are beauty and fragrance junkies, or happen to live a clean, Vegan lifestyle, I have some exciting news for you! Introducing PHLUR, an indie fragrance start-up that is changing the way of fragrance by having produced a line of six unisex scents that are vegan, cruelty-free, paraben and phthalates free, made with 20% recycled glass, ingredients are responsibly sourced, packaging is FSC certified and the bottle is painted with vegetable paint to keep the juice protected and free of light stabilizers. 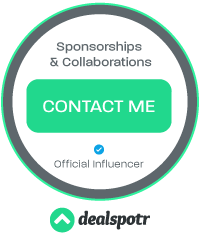 Additionally, they donate $5 from each product to two different organizations – the Central Park Conservancy and the International Union for the Conservation of Nature (IUCN). I just love a brand that gives back, don't you? Here in NE Ohio, the weather can be kind of unpredictable this time of year. In fact, we recently went from several inches of SNOW....In APRIL....to a 75 degree day, all within a 72 hour period. Weird, right? So we try to be ready for anything during spring. We keep our heavy coats and sweaters handy, but we also make sure we have our umbrellas and rain gear easily accessible, too. April showers happen, and they happen a LOT. Mother's Day is coming up, folks! 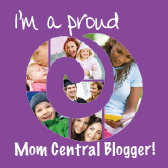 Have you decided what you'll be getting for the fabulous Moms in your life? If you're stuck, and having a hard time deciding on the perfect gift, why not check out some of the leading women's fragrances at FragranceMarket.us? FragranceMarket.us is one of the nation’s largest and trusted online retailers of genuine designer fragrances and related accessories. They carry over 3,000 genuine, brand name fragrances, skincare, makeup, haircare, all at discount prices. FragranceMarket.is carries the most popular names in fragrance including Calvin Klein, Lacoste, Escada, Hugo Boss, Carolina Herrera, Paco Rabanne, Michael Kors, Thierry Mugler, DKNY, Coach, Davidoff, Vera Wang, and many other in-demand luxury brands. They’re bringing the traditional shopping experience right to your computer for the utmost convenience, and at the best prices, too! Do you love supporting eco-friendly businesses? Petmate is proud to not only help pets everywhere, but doing so without hurting the environment by minimizing its carbon footprint. Part of what makes them so unique is that many of their products are made from recycled materials (more than 50%), and created in the United States in their Arlington, Texas facility. As well, they are the only pet manufacturer to make their own resin from pre-consumer, recyclable products like diapers, tape, medical gowns, home insulation wrap, and more. In fact, they go through 80 million pounds of it each year! They have done such a fantastic job reducing their carbon footprint and keeping millions of plastic out of landfills that they earned the prestigious Edison Green Award. To learn more, make sure to check out this awesome video below about how Petmate goes out of their way to help the environment and keeps jobs in the United States. To see some of the amazing products that are made right here in the United States by Petmate, make sure to check out Budget Earth’s 9 Eco-Friendly Petmate Products for Cats & Dogs here! Want to try one of their awesome products for yourself? 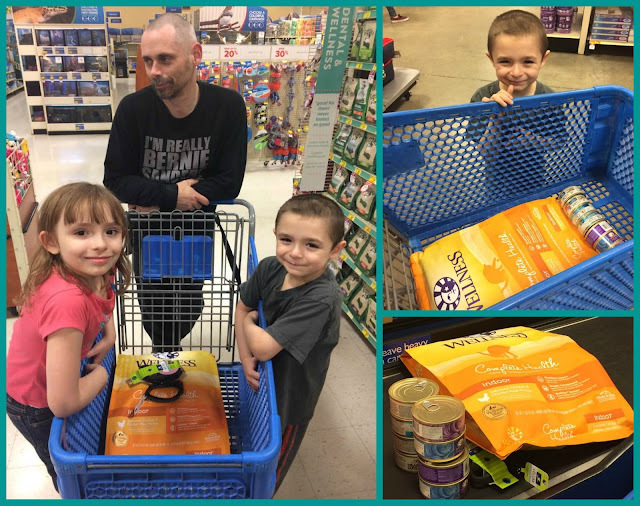 Budget Earth and some of their favorite bloggers are excited to be working with Petmate on this awesome giveaway! One very lucky reader will win a Petmate Ultra Vari Kennel in their choice of size ($17.99 - $149.99). To learn more, make sure to read the rules below and then enter through the Rafflecopter! 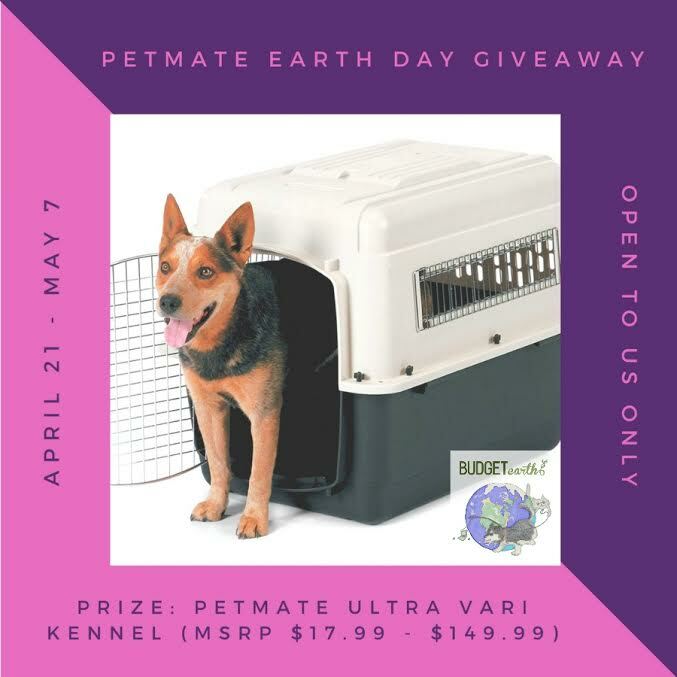 One lucky reader will win a Petmate Ultra Vari Kennel in their choice of size ($17.99 - $149.99). Sweepstakes ends May 7th at 11:59pm ET. You know the old saying, "You are what you eat"?... Well, we humans have to make those decisions for our animal friends. In fact it's an even bigger deal for them because they eat the same thing almost everyday. How boring must that get?! Anyway, our feline and canine friends cannot speak up for themselves and choose which foods they prefer to be part of their diet. They rely on us to do our research and choose the highest quality foods that will help keep them happy and healthy for many years to come. This is a responsibility I don't take lightly as a pet owner, and I always try to choose our pets' foods with their overall well-being in mind. And yes, the animals have to LIKE the food, too. I have some incredibly picky kitties in my home, so taste absolutely does matter here as well. 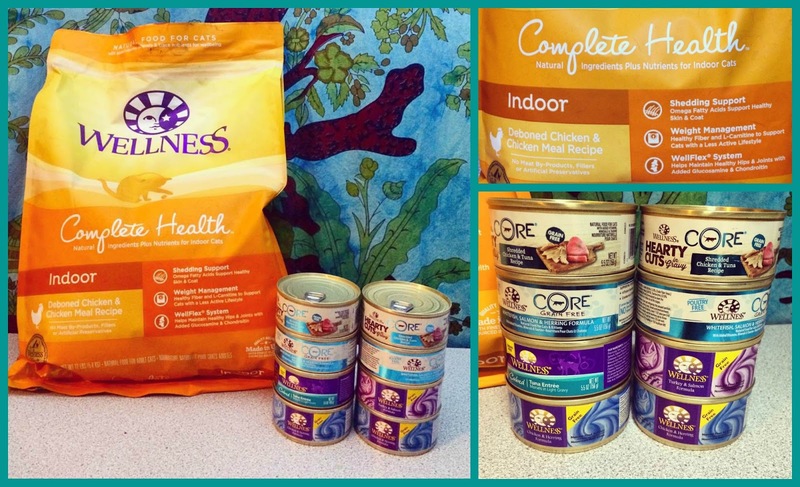 Since it's actually the Year of the Cat, we decided to reexamine our cats' diets. We have 6 cats, and they tend to get picky and crave change sometimes. I'm always keeping my eyes peeled for nutritious, high quality foods that will have my kitties purring with approval while taking care of their specific nutritional needs. Recently, we learned about three NEW Grain Free options in the Wellness® Complete Health line. Adult: deboned Chicken and Chicken Meal, Indoor: Salmon and Herring Meal, Kitten: Deboned Chicken and Chicken Meal. 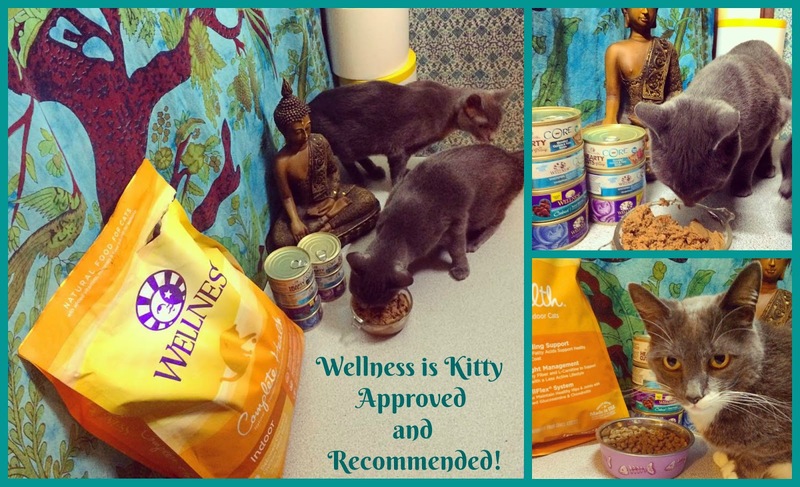 We're fans of the Wellness® brand in general, since they specialize in creating pet foods that offer only the best, balanced nutrition to our furry family members. All of Wellness' recipes are free from corn, carrageenan, soy and wheat as well as artificial colors and flavors. At Wellness®, they do whatever it takes to create the healthiest foods for the pets that depend on us. Food feeds their souls, sustains their lives and protects their bodies. That’s why Wellness has a diverse team of animal lovers, nutritionists and vets has only one mission: To help you provide your pet a healthy, happy, long life through the power of natural nutrition. The Wellness Difference is about being more than natural. And it’s not about what is left out—no fillers, or artificial ingredients—these are a given for the folks at Wellness. True Wellness is about what they put in—a small number of simple, pure, authentic ingredients. Wellness believes this is the way to make superior food for our animals. The Wellness Difference means every ingredient has a purpose in every food they make. They study until they’re confident of its health benefit… and then, they make sure to put in the right amount so you’ll see a difference in your animal— Wellness never adds ingredients just to have the newest ‘buzzword’ on the label. We picked up a nice variety of Wellness® dry and canned foods for our kitty companions. We were greeted at the door by Noodles, Mary Jane, and Cheeseball, who couldn't wait to see what tasty morsels we brought home with us. Check these cats out! They wasted absolutely no time in sampling their new foods from Wellness! Both the dry and canned foods were a huge hit, but the star of the show has to be the Salmon and Herring Meal. Or maybe the Tuna....Or maybe it was the Complete Health Indoor Dry food. Okay. So my typically picky cats devoured it all with absolutely no complaints. Looks like Wellness is a winner in our home! As a pet owner, I feel good about that, since I know that Wellness only offers the best for our furry family members! 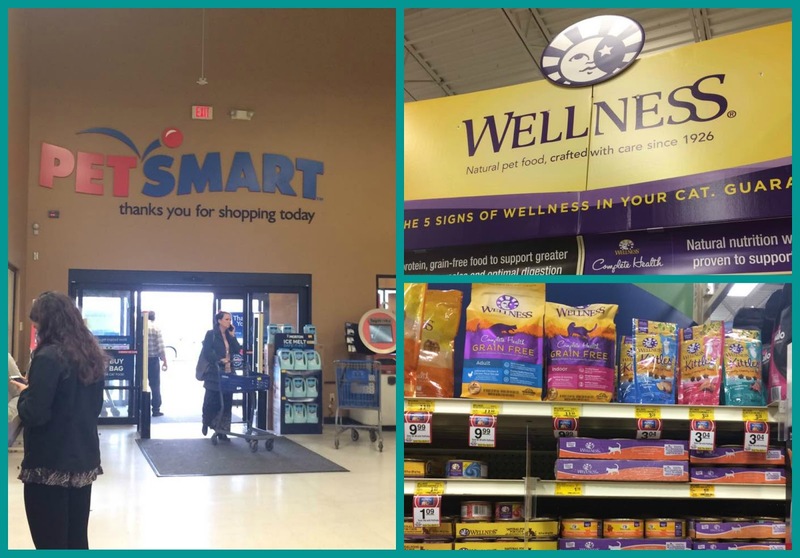 Catisfaction Guarantee: if your cat doesn’t like the new Wellness recipes, please return the unused portion back to Petsmart for a full refund. New Zealand is one of the last bastions of purity as an environmentally protected and GMO Free region with the cleanest oceans on the globe. Case in point, Manuka is the gold standard for honey and is produced exclusively in New Zealand from bees and flowers that are environmentally protected. Enjoy these safe and soothing products every day and feel great eating them! No artificial flavors, colors, no corn syrup or refined sugars and NO preservatives. Well, even though we saw a few inches of snow a couple weeks ago here in NE Ohio, I think it's finally safe to say that spring is here. In these parts of the world, that also means that grilling season has officially arrived, too. Here in the Cleveland area, we really don't need much coaxing to break out our grills. Shoot, it can be snowing and frigid, and guaranteed, somewhere in NE OH, someone is still grilling. I prefer to wait until the temperature is about double my age to venture out to grill since cold and I do not get along well, but to each their own. Anyway. We're absolutely thrilled that the weather has warmed up and that we can start spending our days and evenings in the yard, doing things together as a family. Whether it's grilling burgers, dogs, and steaks, setting up our massive inflatable waterslide, or sitting around a fire making tasty S'mores, we make the best memories outdoors. Blue Rhino also carries Grills, Fire Pits, Fireplace Accessories, and even Grilling Tools. How cool is that?! I'm actually drooling over their Mr. Pizza Oven and Grill. Recently, they sent me an assortment of these awesome summer must haves to check out for myself. We couldn't wait to check them out!